Our CEO, Pam Moore is one of the most in-demand international keynote speakers in the world. Pam has presented for IBM, Lowes Home Improvement, GolfWeek, British Council, Sony Playstation, Polish Insurance Association, Chick-Fil-A, Caribbean Association of Corporate Counsel, International Classified Media Association, Social Media Marketing World, Hubspot Inbound, Social Media Strategies Summit and numerous other brands and conferences. Pam is ranked by Forbes as a Top 10 Social Media Power Influencer, Top 10 Digital Marketers to Follow on Twitter, Top 10 most retweeted by digital marketers and the list goes on. She is a best selling author with 20 years of experiences helping entrepreneurs to Fortune 100 organizations build winning brands, and integrated platforms that deliver measurable results. Pam has a zest for life, and helping bridge the digital divide to help human beings connect with one another in authentic ways. 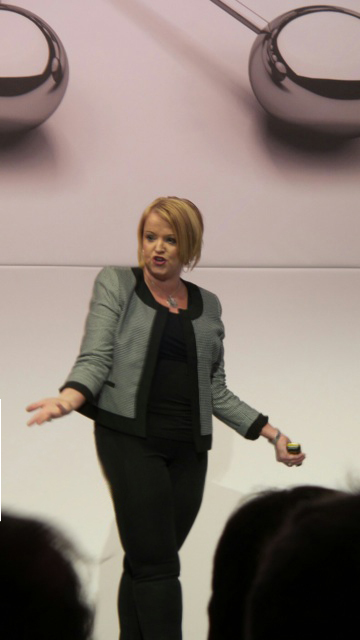 Pam leaves her audiences feeling energized and empowered to take on the always changing world of technology. When she presents as a keynote speaker for your event she brings her virtual audience with her to help you increase event sales, ignite your audience and build a lasting community. With more than 240,000 engaged Twitter followers, top of iTunes charts Podcast – Social Zoom Factor, active blogging community, weekly Tweet chats (#GetRealChat) delivering 40-90+ million impressions weekly, Pam is globally recognized as one of the most prominent thought leaders on the subject of social and new media as it relates to business. Her work has been noted in Forbes, Huffington Post, Entrepreneur, Yahoo! News, Business Insider, USA Today, Inc, Orlando Sentinal, Orlando Business Journal, Social Media Today, Business to Community to name a few.